I haven’t been posting much lately. Things have gotten a bit hectic at home and at work. Our office has a two-day conference this coming week and someone has to organize the logistics with the hotel, meeting space and menus, order the meeting packets and give-aways, design and mail invitations, postcards, meeting packets and newsletters, collect the registration data, design and print the programs, table signs, and nametags. That someone is me. While I like doing all those things, I do not want to look at a computer screen. But…I have been busy not knitting. A few months ago I decided I was going to do something from my bucket list. Don’t ask me what else is on it as I just started making a bucket list. 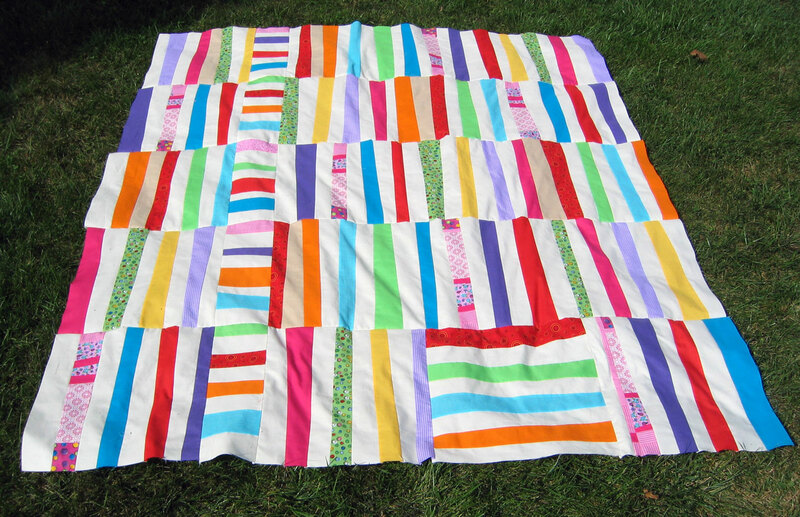 Anyway, making a quilt is on that list so I’m making quilts for my grandchildren. 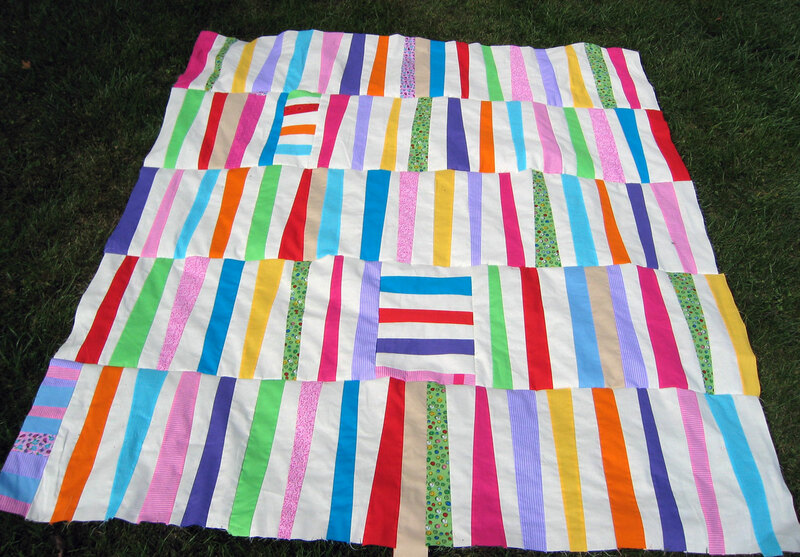 I just finished two twins bed sized quilt tops and plan to piece the backing as well to make both sides fun. The twins share a bedroom so I made theirs similar. Both are the same “Stack and Slash” technique using mostly the same fabrics in each. When I saw this on Chasing Cottons blog, I knew it would be possible for me to do. The tutorial from Kate Conkil was easy to follow. I used three stacks of fabric instrad of two as I was making a larger quilt. I also had to add some fabric tp make it wider for the twin bed. Extra blocks were cut up and pieced together for a horizontal column. I used Kona solids and some cotton scraps from other sewing projects. I even used some fabric scraps from the dresses I made them a couple of years ago. (Yes, the one that got eaten by the Destroyer.) I bought backing fabric when I was in Ohio this past July. I don’t have the backing plan finalized but I do have it narrowed down to two. Or three. The Stack and Slash method seemed like the perfect technique since no seams have to match up. Adding the row of horizontal stripes negated that right away but I did still got everything to line up. You might be able to enlarge the photos by clicking on them. I think. I plan to quilt these on my new sewing machine. Simple lines. Simple wavy lines. Simple wonky lines most likely. But that is a long way off. This entry was posted in crafts, quilting and tagged fabric, fabric scraps, quilt tops, quilting, quilts, sewing, sewing projects by Patti_is_knittinginflashes. Bookmark the permalink. What a great idea! I think this will be my next sewing project since I have a million scraps of fabric that I was trying to use up. I love how bright and happy yours turned out. NICE JOB …..love them .